Can you identify today’s top news anchors? For many Americans, matching names with news faces is tougher than it was roughly 30 years ago. The lower public awareness of news anchors reflects a large decline in the audience for nightly network news since the 1980s. For example, in November 1985 an average of 48 million Americans watched one of the network newscasts each evening. By 2013, that number had fallen to 24.5 million, according to Pew Research analysis of Nielsen Media Research data. The audience for network news is older today than in the 1980s and this is reflected in how familiar different age groups are with network broadcasters. While recognition of Williams compared with Rather is lower across all demographic groups, the gap between young and old is now wider today than in 1985. In the August survey, just 15% of those under 30 identified Williams, compared with about three-in-ten in older age groups. 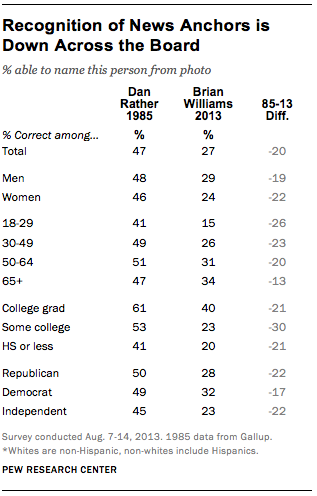 In 1985, 41% of young people identified Rather; about half of older people recognized the CBS anchor. Television remains the public’s top daily news source, but the audience for network TV news has steadily declined over the years as people have migrated to other places for news; namely cable TV and digital sources. In Pew Research Center news consumption surveys, the share of Americans who say they regularly watch a nightly network news program has declined from 60% in 1993 (the earliest available measure) to just 27% in 2012. Young people are among the least likely to regularly watch network news: 11% of those 18-29 in 2012, compared with 46% of this age group in 1993. About half (49%) of 18-29 year olds say they never watch. Older Americans, those 65 and up, are still far more likely to regularly watch network news than younger people, yet their regular viewership has dropped by almost half since 1993, from 75% down to 40% in 2012. According to Nielsen Media Research, the share of the public from the media’s highly coveted 25-54 year old demographic that watched NBC, ABC or CBS network news accounted for only 26% of all viewers in the 2012-13 ratings season. 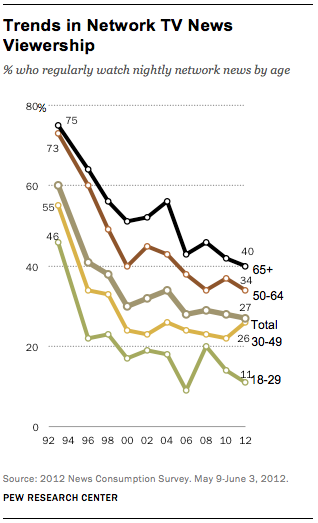 The vast majority of viewers were older Americans; a trend that is expected to continue. 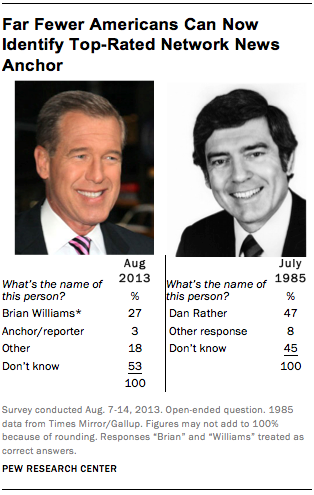 Note: The question about Brian Williams was asked as part of the most recent Pew Research knowledge survey. But the open-ended nature of the question did not allow us to include it in the accompanying News IQ Quiz which relies on multiple choice questions. See questionnaire results here. Other questions from this survey previously released.